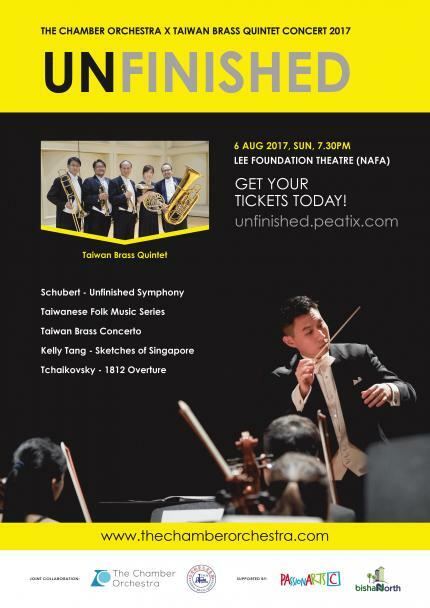 Unfinished is our latest concert following Prelude. This concert shares the name with our first piece, Schubert’s famously named symphony, hoping to put to word our ongoing passion for the music you are about to enjoy. This year we have the honour of hosting friends from Taiwan who have brought their music over, and on the same stage, The Chamber Orchestra and Taiwan Brass Quintet presents Taiwanese Folk Music Series. In the spirit of cultural exchange, we reciprocate by presenting Sketches of Singapore, an arrangement of local tunes and melodies by our local composer Kelly Tang. And to end an Unfinished concert, with what else but a loud bang, featuring Tchaikovsky's 1812 Overture, presented with the full force of The Chamber Orchestra and Taiwan Brass Quintet.